B3: Visualization Analysis and Design. AK Peters Visualization Series, CRC Press, 2014. Visualization Analysis and Design provides a systematic, comprehensive framework for thinking about visualization in terms of principles and design choices. The book features a unified approach encompassing information visualization techniques for abstract data, scientific visualization techniques for spatial data, and visual analytics techniques for interweaving data transformation and analysis with interactive visual exploration. It emphasizes the careful validation of effectiveness and the consideration of function before form. The book is suitable for a broad set of readers, from beginners to more experienced visualization designers. It does not assume any previous experience in programming, mathematics, human-computer interaction, or graphic design and can be used in an introductory visualization course at the graduate or undergraduate level. C25: GaRSIVis: Improving the Predicting of Self-Interruption during Reading using Gaze Data. Jan Pilzer, Shareen Mahmud, Vanessa Putnam, and Tamara Munzner. Proc. ETVIS 2018. The Gaze Reading Self-Interruption Visualizer integrates a visualization front-end suitable for data cleansing and a prediction back-end that can be run repeatedly as the input data is iteratively improved. J40: A Novel Methodology for Characterizing Cell Subpopulations in Automated Time-lapse Microscopy. Georges Hattab, Veit Wiesmann, Anke Becker, Tamara Munzner and Tim W. Nattkemper. Frontiers in in Bioengineering and Biotechnology 28;6:17, 2018. The patch lineage graph encapsulates the history of cellular colonies by exploiting temporal and spatial coherence of subpopulations using a particle-based approach, for datasets where the traditional approach of single-cell detection fails due to high density, and high diversity of cell shapes and numbers, for high-resolution images with high amounts of noise. J39: Evidence-based design and evaluation of a whole genome sequencing clinical report for the reference microbiology laboratory. Anamaria Crisan, Geoff McKee, Tamara Munzner, and Jennifer L. Gardy. PeerJ 6:e4218, 2018. Evidence-based guidelines for communicating tuberculosis genomic test results, using rigorous methods for generating and testing alternative formats based on iterative and human-centered visualization design study methodology. J38: Bridging From Goals to Tasks with Design Study Analysis Reports. Framework based on analysis reports derived from open-coding 20 design study papers published at IEEE InfoVis 2009-2015, to build on the previous work of abstractions that collectively encompass a broad variety of domains. C24: On Regulatory and Organizational Constraints in Visualization Design and Evaluation. Anamaria Crisan, Jennifer Gardy, and Tamara Munzner. ACM Workshop on Beyond Time And Errors: Novel Evaluation Methods For Visualization (BELIV) 2016. Discussion of adapting visualization methodology in the highly regulated fields such as public health, with a case study on tuberculosis clinical care through the BC Centre for Disease Control. J37: Timelines Revisited: A Design Space and Considerations for Expressive Storytelling . Matthew Brehmer, Bongshin Lee, Benjamin Bach, Nathalie Henry Riche, and Tamara Munzner. IEEE Transactions on Visualization and Computer Graphics 23(9) 2017. An exploration of the design space of timelines for presentation. J36: Matches, Mismatches, and Methods: Multiple-View Workflows for Energy Portfolio Analysis. Matthew Brehmer, Jocelyn Ng, Kevin Tate, and Tamara Munzner. IEEE Transactions on Visualization and Computer Graphics (Proc IEEE InfoVis 2015), 22(1):449-458. Redesign study in the energy analysis domain. 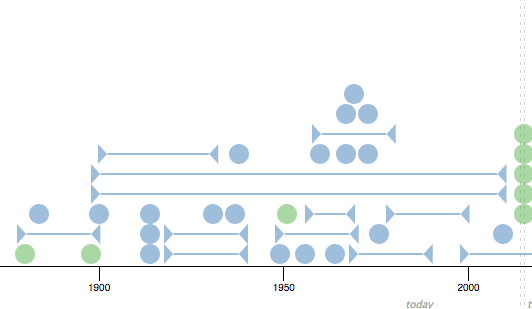 J35: TimeLineCurator: Interactive Authoring of Visual Timelines from Unstructured Text. Johanna Fulda, Matthew Brehmer, and Tamara Munzner. IEEE Transactions on Visualization and Computer Graphics (Proc IEEE VAST 2015), 22(1):300-309. Authoring tool for journalists and others who want to quickly create timelines from free-form text. J34: Detangler: Visual Analytics for Multiplex Networks. Computer Graphics Forum (Proc. EuroVis 2015) 34(3):321-330, 2015. Visual analysis of group cohesion in multiplex networks through dual linked views, featuring the new data abstractions of substrate and catalyst networks. C23: Visualizing Dimensionally-Reduced Data: Interviews with Analysts and a Characterization of Task Sequences. Matthew Brehmer, Michael Sedlmair (University of Vienna), Stephen Ingram, and Tamara Munzner. We characterize five task sequences related to visualizing dimensionally-reduced data, drawing from data collected from interviews with ten data analysts spanning six application domains, and from our understanding of the technique literature. J33: A Search Set Model of Path Tracing in Graphs. Jessica Dawson, Joanna McGrenere, and Tamara Munzner. A predictive model based on extensive qualitative analysis from an observational study, with preliminary validation through a hierarchical multiple regression analysis comparing graph readability factors. J32: Overview: The Design, Adoption, and Analysis of a Visual Document Mining Tool For Investigative Journalists. Matthew Brehmer, Stephen Ingram, Jonathan Stray, and Tamara Munzner. To appear in IEEE Trans. Visualization and Computer Graphics (Proc. InfoVis 2014). A design study about Overview, an application for the systematic analysis of large document collections based on document clustering, visualization, and tagging. J31: Dimensionality Reduction for Documents with Nearest Neighbor Queries. Stephen Ingram and Tamara Munzner. To appear in Neurocomputing (Special Issue Visual Analytics using Multidimensional Projections), 2014. The QSNE document-focused dimensionality reduction algorithm combines stochastic neighborhood embedding with query techniques from information retrieval. J30: The Nested Blocks and Guidelines Model. Michael Sedlmair, Miriah Meyer, P. Samuel Quinan, and Tamara Munzner. Information Visualization Journal, 2013, in press. Journal version of BELIV workshop paper on nested model extension; additions are analysis of three papers from InfoVis12 with the NBGM, and an examination of design models in previous work. J29: Empirical Guidance on Scatterplot and Dimension Reduction Technique Choices. Michael Sedlmair, Tamara Munzner, and Melanie Tory. IEEE Trans. Visualization and Computer Graphics (Proc. InfoVis), 19(12):2634-2643, 2013. Quantitative data study analyzing three types of scatterplots (2D, SPLOM, and 3D) and four types of DR choices. Key findings: 2D is often good enough, and switching DR techniques is the best next step; SPLOMs occasionally add value; interactive 3D rarely helps and often hurts. J28: A Multi-Level Typology of Abstract Visualization Tasks. Matthew Brehmer and Tamara Munzner. IEEE Trans. Visualization and Computer Graphics (Proc. InfoVis), 19(12):2376-2545, 2013. Framework for analyzing individual and compound tasks in terms of why-what-how. Joel A. Ferstay, Cydney B Nielsen and Tamara Munzner. IEEE Trans. Visualization and Computer Graphics (Proc. InfoVis), 19(12):2546-2555, 2013. Design study for genomic data proposing alternative to standard genome browser approach. C22: The Four-Level Nested Model Revisited: Blocks and Guidelines. Miriah Meyer, Michael Sedlmair, and Tamara Munzner. Proc. Workshop on BEyond time and errors: novel evaLuation methods for Information Visualization (BELIV), 2012. An extension to the four-level Nested Model for design and validation of visualization systems that defines the term guidelines in terms of blocks at each level. C21: Glint: An MDS Framework for Costly Distance Functions. Proc. SIGRAD 2012, p 29-38. Glint is designed to automatically minimize the total number of distances computed by progressively computing a more and more densely sampled approximation of the distance matrix. J26: Design Study Methodology: Reflections from the Trenches and the Stacks. Michael Sedlmair, Miriah Meyer, and Tamara Munzner. We provide definitions, propose a methodological framework, and provide practical guidance for conducting design studies. J25: RelEx: Visualization for Actively Changing Overlay Network Specifications. Michael Sedlmair, Annika Frank, Tamara Munzner, and Andreas Butz. IEEE Trans. Visualization and Computer Graphics (Proc. InfoVis 2012), 18(12):2729-2738, 2012. Design study focused on supporting automotive engineers who need to specify and optimize traffic patterns for in-car communication networks. The task and data abstractions for actively making changes to an overlay network, where logical communication specifications must be mapped to an underlying physical network network, are very different than the dominant use cases from the domain of social network analysis. J24: A Taxonomy of Visual Cluster Separation Factors. Qualitative evaluation of 800+ plots, including analysis of the reasons for failure of previous cluster separation metrics and a taxonomy of factors that affect separation. J23: Vismon: Facilitating Analysis of Trade-Offs, Uncertainty, and Sensitivity In Fisheries Management Decision Making. Maryam Booshehrian, Torsten Möller, Randall Peterman, and Tamara Munzner. Computer Graphics Forum (Proc. EuroVis 2012), 31(3):1235-1244, 2012. Design study supporting the analysis of fisheries simulation data, including sensitivity analysis, global trade-offs analysis, and staged uncertainty. C20: The design space of opinion measurement interfaces: exploring recall support for rating and ranking. Proc. Conf. on Human Factors in Computing Systems (CHI) 2012, pp 2035-2044. The proposed design space is spanned by two axes: recall support, and absolute rating vs. relative ranking. M1: Applying Information Visualization Principles to Biological Network Displays. Proc. SPIE-IS&T Human Vision and Electronic Imaging 2011, SPIE Vol 7865, 78650D1-13. Invited paper discussing Cerebral and Pathline design rationale in detail in the context of the Nested Model framework. Tamara Munzner, Aaron Barsky, Matt Williams. Scientific Visualization: Interactions, Features, Metaphors. Dagstuhl Follow-Ups 2, 2011, Chapter 17, p 240--259. Reflections on the design of a system for visualizing a high-dimensional environmental sustainability dataset. Despite some successes on designing visual encoding and interaction techniques, QuestVis was ultimately not deployed because of a mismatch between the design goals of the project and the true needs of the target user community. We analyze this breakdown in the context of the Nested Model framework, which was motivated in part by this experience. B2: A Guide to Visual Multi-Level Interface Design From Synthesis of Empirical Study Evidence. Heidi Lam and Tamara Munzner. This monograph provides design guidelines for designing multi-level interfaces based on a fine-grained analysis of of 22 empirical studies. We considered three multi-level interface types in this synthesis review: temporal, or temporal switching of the different levels as in zooming interfaces; separate, or displaying the different levels simultaneously but in separate windows as in overview + detail interfaces; and embedded, or showing the different levels in a unified view as in focus + context interfaces. J22: MulteeSum: A Tool for Comparative Temporal Gene Expression and Spatial Data. Miriah Meyer, Tamara Munzner, Angela DePace and Hanspeter Pfister. IEEE Trans. Visualization and Computer Graphics 16(6):908-917 (Proc. InfoVis 2010), 2010. Design study about a visualization tool that supports exploration of multiple possible computational summaries that mix spatial information about each cell in a developing fruit fly embryo, gene expression measurements over time, and data from multiple related species or organisms. C19: DimStiller: Workflows for dimensional analysis and reduction. Stephen Ingram, Tamara Munzner, Veronika Irvine, Melanie Tory, Steven Bergner, and Torsten Möller. IEEE Conference on Visual Analytics Software and Technologies (VAST) 2010, p 3-10. 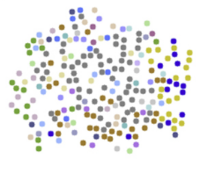 Dimensionality reduction for the rest of us: system paper about toolkit for dimensionality reduction providing local and global guidance to users who may not be experts in the mathematics of high-dimensional data analysis. Daniel Archambault, Tamara Munzner, and David Auber. IEEE Trans. Visualization and Computer Graphics 17(3):276--289, 2011. Journal version of PacificVis TugGraph paper. J20: Pathline: A Tool for Comparative Functional Genomics. Miriah Meyer, Bang Wong, Tamara Munzner, Mark Styczynski and Hanspeter Pfister. Design study of a visualization tool for comparative functional genomics supporting simultaneous analysis of functional, pathway, and phylogenetic data. We present two new visual encoding techniques: linearized metabolic pathways, and curvemaps. J19: A Nested Model for Visualization Design and Validation. IEEE Trans. Visualization and Computer Graphics (Proc. InfoVis 09), 15(6):921-928, 2009. This model provides a unified framework for considering both the design and the validation of visualization systems at four cascading levels, with prescriptive advice on determining appropriate evaluation approaches by identifying threats to validity unique to each level. J18: MizBee: A Multiscale Synteny Browser. Miriah Meyer, Tamara Munzner, and Hanspeter Pfister. IEEE Trans. Visualization and Computer Graphics (Proc. InfoVis 09), 15(6):897-904, 2009. Design study on the creation of a multiscale synteny browser for exploring conservation relationship in comparative genomics data. IEEE Pacific Visualization Symposium 2009, pp 113-121. TugGraph is a system for exploring paths and proximity around nodes and subgraphs in a multilevel graph. A book chapter for an undergraduate computer graphics textbook summarizing process, principles, and techniques for visualization with an emphasis on abstract data. J17: Glimmer: Multilevel MDS on the GPU. Stephen Ingram, Tamara Munzner and Marc Olano. IEEE Trans. Visualization and Computer Graphics (TVCG) 15(2):249-261, Mar/Apr 2009. Glimmer is a new multilevel multidimensional scaling algorithm that exploits the GPU. We demonstrate its benefits in a detailed comparison against several previous algorithms. J16: InnateDB: facilitating systems-level analyses of the mammalian innate immune response. Molecular Systems Biology 4:218, 2008. Paper for the biological community describing InnateDB, including the Cerebral visualization component. J15: Cerebral: Visualizing Multiple Experimental Conditions on a Graph with Biological Context. Aaron Barsky, Tamara Munzner, Jennifer L. Gardy, and Robert Kincaid. IEEE Transactions on Visualization and Computer Graphics (Proc. InfoVis 2008) 14(6) (Nov-Dec) 2008, p 1253-1260. We describe the data information display needs of immunologists and describe the design decisions used to create Cerebral, a system that incorporates experimental data directly into the graph display, using the biologically guided graph layout announced in the previous appnote. J14: GrouseFlocks: Steerable Exploration of Graph Hierarchy Space. IEEE Transactions on Visualization and Computer Graphics 14(4):900-913 (July/August) 2008. GrouseFlocks supports interactive exploration of the space of possible hierarchies for an input graph with domain-specific attributes at the nodes. The system generates hierarchies that reflect the underlying graph topology by requiring that subgraphs respect edge and connectivity conservation. C17: Increasing the Utility of Quantitative Empirical Studies for Meta-analysis. Proc. CHI Workshop on BEyond time and errors: novel evaLuation methods for Information Visualization (BELIV), 2008, pp. 21-27. Based on our experience in extracting design guidelines from existing quantitative studies, we recommend improvements to both study design and reporting to promote meta-analysis. C16: LiveRAC - Interactive Visual Exploration of System Management Time-Series Data. Peter McLachlan, Tamara Munzner, Eleftherios Koutsofios, Stephen North. Proc. Conf. on Human Factors in Computing Systems (CHI) 2008, pp 1483-1492. The LiveRAC visualization system supports the analysis of large collections of time-series data with hundreds of parameters across thousands of network devices. It provides high information density using a reorderable matrix of charts, with semantic zooming adapting each chart's visual representation to the available space. D1: Process and Pitfalls in Writing Information Visualization Research Papers. Information Visualization: Human-Centered Issues and Perspectives. Andreas Kerren, John T. Stasko, Jean-Daniel Fekete, Chris North, eds. Springer LNCS Volume 4950, p 134-153, 2008. A book chapter exhorting infovis authors to avoid pitfalls at several stages of research process, including visual encoding during design, a checkpoint before starting to write, and after a full paper draft exists. The paper page includes my current list of favorite design study examples. J13: Spatialization Design: Comparing Points and Landscapes. Melanie Tory, David W. Sprague, Fuqu Wu, Wing Yan So, and Tamara Munzner. IEEE Trans. Visualization and Computer Graphics (Proc. InfoVis 07), 13(6):1262--1269, 2007. For the task we studied, point-based spatializations were far superior to landscapes, and 2D landscapes were superior to 3D landscapes. J12: Overview Use in Multiple Visual Information Resolution Interfaces. Heidi Lam, Robert Kincaid, and Tamara Munzner. IEEE Trans. Visualization and Computer Graphics (Proc. InfoVis 07) 13(6):1278--1285, 2007. We compared four interfaces: overview-only, detail-only, separate overview and detail windows, and detail embedded within overview as in Focus+Context interfaces. C15: Session Viewer: Visual Exploratory Analysis of Web Session Logs. Heidi Lam, Daniel Russell, Diane Tang, and Tamara Munzner. Proc. IEEE Symposium on Visual Analytics Science and Technology (VAST), p 147-154, 2007. Taking a multiple-coordinated view approach, Session Viewer shows multiple session populations at the Aggregate, Multiple, and Detail data levels to support different analysis styles. C14: Grouse: Feature-Based, Steerable Graph Hierarchy Exploration. Proc. Eurographics / IEEE VGTC Symposium on Visualization (EuroVis 07), p 67-74. 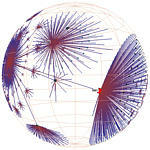 Interactive and steerable exploration of multilevel graph hierarchies, as created by TopoLayout. J11: Cerebral: a Cytoscape plugin for layout of and interaction with biological networks using subcellular localization annotation. Aaron Barsky, Jennifer L. Gardy, Robert E.W. Hancock, and Tamara Munzner. Short note aimed at the bioinformatics community announcing a graph layout approach for protein-protein interaction networks that exploits annotations about where genes/proteins are expressed within a cell and their function. J10: TopoLayout: Multi-Level Graph Layout by Topological Features. Transactions on Visualization and Computer Graphics, 13(2):305--317, Mar/Apr 2007. Multilevel graph drawing algorithm where the original graph is decomposed into features based on topological structures such as trees and clusters, each feature is drawn with an appropriately tuned algorithm, and passes for crossing reduction and overlap elimination reduce visual clutter. J9: Smashing Peacocks Further: Drawing Quasi-Trees From Biconnected Components. IEEE Trans. Visualization and Computer Graphics (Proc. InfoVis 06) 12(5), September 2006, p 813-820. Two-level approach to drawing complex graphs where an area-aware version of the RINGS tree drawing algorithm is used to show the high-level structure, and the force-directed LGL approach is used to show the low-level structure. J8: Composite Rectilinear Deformation for Stretch and Squish Navigation. James Slack and Tamara Munzner. IEEE Trans. Visualization and Computer Graphics (Proc. Visualization 2006) 12(5), September 2006, p 901-908. Navigation for accordion drawing, whereas previous papers focused on rendering. C13: Effects of 2D Geometric Transformations on Visual Memory. Heidi Lam, Ronald A. Rensink, and Tamara Munzner. Proc. Applied Perception in Graphics and Visualization (APGV 2006), 119-126, 2006. Evaluation of how both linear and nonlinear geometric transformations affect visual memory, as opposed to previous paper on visual search. C12: An Evaluation of Pan&Zoom and Rubber Sheet Navigation with and without an Overview. Evaluation comparing navigation techniques and availability of contextual information. J7: Visualization Research Challenges: A Report Summary. Robert Moorhead, Chris Johnson, Tamara Munzner, Hanspeter Pfister, Penny Rheingans, and Terry S. Yoo. IEEE Computing in Science & Engineering, Vol 8, No 4 (July/Aug) 2006, p 66-73. Five-page summary of VRC report. J6: NIH/NSF Visualization Research Challenges Report Summary. Tamara Munzner, Chris Johnson, Robert Moorhead, Hanspeter Pfister, Penny Rheingans, and Terry S. Yoo. IEEE Computer Graphics and Applications, Vol 26, No 2 (March/April) 2006, p 20-24. 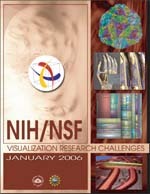 <!- http://tab.computer.org/vgtc/vrc -> B1: NIH/NSF Visualization Research Challenges Report. Chris Johnson, Robert Moorhead, Tamara Munzner, Hanspeter Pfister, Penny Rheingans, and Terry S. Yoo. IEEE Computer Society Press, 2006, ISBN 0-7695-2733-7 (36 page book). This report, sponsored by the NIH and NSF, is a followup to the 1987 NSF Visualization report. Our goal is to evaluate the progress of the maturing field of visualization, to help focus and direct future research projects, and to provide guidance on how to apportion national resources. Our findings and recommendations reflect not only information gathered from visualization and applications scientists during two workshops on Visualization Research Challenges but also input from the larger visualization community. J5: Partitioned Rendering Infrastructure for Scalable Accordion Drawing (Extended Version). James Slack, Kristian Hildebrand, and Tamara Munzner . Information Visualization, 5(2), p. 137-151, 2006. Longer journal version of PRISAD paper, recommended over the conference version. The algorithm explanation is clearer and more detailed. C11: Partitioned Rendering Infrastructure for Scalable Accordion Drawing. Proc. IEEE Symposium on Information Visualization (InfoVis) 2005, pp 41--48. Conference version of PRISAD paper, presenting generic and efficient infrastructure for accordion drawing with an emphasis on rendering. C10: Scalable, Robust Visualization of Large Trees. Dale Beermann, Tamara Munzner, and Greg Humphreys. Proc. EuroVis 2005, pp 37--44. Highly scalable accordion drawing for huge trees of 15 million nodes with leading-edge graphics hardware and 5 million nodes on commodity platforms. C9: SequenceJuxtaposer: Fluid Navigation For Large-Scale Sequence Comparison In Context. James Slack, Kristian Hildebrand, Tamara Munzner, and Katherine St. John. German Conference on Bioinformatics 2004, pp 37-42. Accordion drawing for comparing gene sequences. C8: Steerable, Progressive Multidimensional Scaling. Matt Williams and Tamara Munzner. Proc IEEE Symposium on Information Visualization (InfoVis) 2004, pp 57-64. Steerable multidimensional scaling with progressive layout. C7: Perceptual Invariance of Nonlinear Focus+Context Transformations. Keith Lau, Ron Rensink, and Tamara Munzner. Proc. First Symposium on Applied Perception in Graphics and Visualization (APGV 04) 2004, pp 65-72. We quantify the perceptual cost of geometric transformations for visual search tasks, finding no-cost and low-cost zones for fisheye transformations. J4: TreeJuxtaposer: Scalable Tree Comparison using Focus+Context with Guaranteed Visibility. Tamara Munzner, François Guimbretière, Serdar Tasiran, Li Zhang, and Yunhong Zhou. Visual diff for trees, introducing accordion drawing. G1: Guest Editor's Introduction to Special Issue on Information Visualization. IEEE Computer Graphics and Applications Special Issue on Information Visualization, 22(1), Jan/Feb 2002, pp 20-21. In this short introduction I briefly describe the goals of the field of information visualization to set the stage for the four accepted papers in this special issue, for which I was the guest editor. J3: An initial examination of ease of use for 2D and 3D information visualizations of web content. Kirsten Risden, Mary P. Czerwinski, Tamara Munzner, Daniel B. Cook. International Journal of Human Computer Studies, Vol. 53, No. 5, November 2000, pp 695-714. This paper discusses a user study conducted at Microsoft Research that found a statistically significant improvement in task time when a novel web browser that included the H3Viewer was compared to more traditional browsers. T1: Interactive Visualization of Large Graphs and Networks. Ph.D. Dissertation, Stanford University, June 2000. My dissertation includes a chapter each on the H3, Planet Multicast, and Constellation projects, with much more analysis than appeared in any of the original papers. Maneesh Agrawala, Denis Zorin, Tamara Munzner. Proceedings of the 11th Eurographics Rendering Workshop, June 26-28 2000, pp 125-136. These proceedings were also published as Rendering Techniques 2000, B. Peroche and H. Rushmeier, eds, Springer, 2000. A paper on interactive rendering of scenes where objects can have different projections, as in the simulaneous multiple viewpoints of Cubist paintings. C4: Constellation: A Visualization Tool For Linguistic Queries from MindNet. Tamara Munzner and François Guimbretière and George Robertson. Proceedings of the 1999 IEEE Symposium on Information Visualization (InfoVis 99), 1999, pp 132-135. A paper on a 2D interactive system that uses a custom graph layout algorithm and many perceptual channels to help computational linguists debug their algorithms for generating and using large semantic networks. C4: Drawing Large Graphs with H3Viewer and Site Manager. Proceedings of Graph Drawing '98, Montreal, Canada, August 1998, Lecture Notes in Computer Science 1547, pp. 384-393, Springer-Verlag. A paper which presents the H3Viewer guaranteed frame rate drawing algorithm, along with a brief review of the H3 layout algorithm for context. Very large graphs can be navigated at a constant frame rate, as long as the entire graph can fit into main memory. The viewer is custom OpenGL/C++ code. My implementation of the algorithm discussed here was shipped with the Site Manager 1.1 software from SGI. The source is available for free noncommercial use. J2: Exploring Large Graphs in 3D Hyperbolic Space. IEEE Computer Graphics and Applications, Vol. 18, No. 4, pp 18-23, July/August 1998. An article which briefly reviews the H3 layout and H3Viewer drawing algorithms. The main new material here is a discussion about possible tasks for graph drawing beyond the global overview problem. C3: H3: Laying Out Large Directed Graphs in 3D Hyperbolic Space. Proceedings of the 1997 IEEE Symposium on Information Visualization (InfoVis 97), October 20-21 1997, Phoenix, AZ, pp 2-10, 1997. A paper that presents a much improved layout algorithm that exploits some of the properties of 3D hyperbolic space to achieve reasonable information density. The viewer is a highly modified version of Geomview, which supports manual subtree collapse and expansion. My implementation of the algorithm discussed here was shipped with the Site Manager 1.0 software from SGI. C2: Visualizing the Global Topology of the MBone. Tamara Munzner and Eric Hoffman and K. Claffy and Bill Fenner. Proceedings of the 1996 IEEE Symposium on Information Visualization (InfoVis 96), October 28-29 1996, San Francisco, CA, pp 85-92, 1996. A case study describing the Planet Multicast project: an interactive 3D geographic visualization of the Internet's multicast backbone, where tunnels are shown as arcs on a globe. C1: Visualizing the Structure of the World Wide Web in 3D Hyperbolic Space. Tamara Munzner and Paul Burchard. Proceedings of the Virtual Reality Modelling Language (VRML 95) (San Diego, California, December 14-15, 1995), special issue of Computer Graphics, pp 33-38, ACM SIGGRAPH, New York, 1995. The first of my hyperbolic papers. The layout algorithm is the the most straightforward extension of cone trees to 3D hyperbolic space. The viewer is Geomview/WebOOGL. The system allows neither manual nor automatic collapsing of the graph, so scalability is extremely limited. J1: Interactive Methods for Visualizable Geometry. Andrew J. Hanson and Tamara Munzner and George Francis. IEEE Computer, Vol. 27, No. 4, pp 73-83, July 1994. 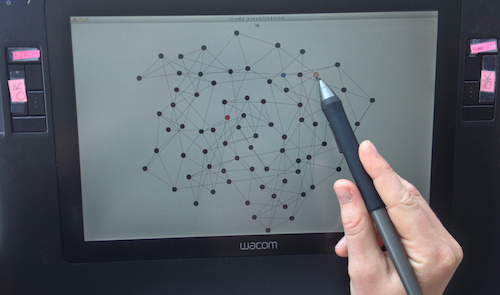 A survey article about interactive mathematical visualization, includes many pictures. <!-N16-> Poster. Showcasing the design study methodology through simpler design challenges: An application to a microbial genomics clinical report design. Anamaria Crisan, Geoffrey McKee, Tamara Munzner, Jennifer L. Gardy. <!-N15-> Poster. PaperQuest: A Visualization Tool to Support Literature Review. ACM CHI 2016 Poster, May 2016. <!-N14-> Poster. SEQIT: Visualizing Sequences of Interest in Eye Tracking Data. Mike Wu and Tamara Munzner. <!-N13-> Technical Report. Dimensionality Reduction in the Wild: Gaps and Guidance. Michael Sedlmair, Matt Brehmer, Stephen Ingram, and Tamara Munzner. UBC Computer Science Technical Report TR-2012-03, June 2012. Stephen Ingram, Tamara Munzner, and Jonathan Stray. UBC Department of Computer Science Technical Report TR-2012-01, May 2012. <!-N11-> Technical Report. Ephemeral Paths: Gradual Fade-In as a Visual Cue for Subgraph Highlighting. Jessica Dawson, Joanna McGrenere, Tamara Munzner, Karyn Moffatt, and Leah Findlater. UBC Computer Science Technical Report TR-2011-10, August 2011. <!-N10-> Technical Report. A Guide to Visual Multi-Level Interface Design From Synthesis of Empirical Study Evidence. UBC Computer Science Technical Report TR-2010-11, October 2010. Interfaces for the 22 empirical studies covered in the summary synthesis. Final version: Morgan Claypool Synthesis Lecture monograph. <!-N9-> Technical Report. Reflections on QuestVis: A Visualization System for an Environmental Sustainability Model. Tamara Munzner, Aaron Barsky, and Matt Williams. UBC Computer Science Technical Report TR-2009-24, November 2009. Final version: Dagstuhl Follow-Ups volume 2. <!-O9-> Poster. InnateDB and Cerebral: Computational Tools for the Systems-Level Analysis of Innate Immunity. Gardy, J., Lynn, D., Winsor, G., Barsky, A., Roche, F., Chan, T., Laird, M., Chan, C., Shah, N., Richard, N., Lo, R., Naseer, M., Que, J., Yau, M., Acab, M., Tulpan, D., Whiteside, M., Munzner, T., Hancock, R., and Brinkman, F.
Experimental Biology, April 5-9, 2008, San Diego, CA, USA. <!-N8-> Technical Report. GLUG: GPU Layout of Undirected Graphs. Stephen Ingram, Tamara Munzner, and Marc Olano. UBC Computer Science Technical Report TR-2007-23, October 2007. UBC Computer Science Technical Report TR-2007-21, September 2007. <!-N6-> Technical Report. Glimmer: Multilevel MDS on the GPU. Final version: IEEE TVCG paper. <!-O8-> Poster. InnateDB: A knowledge base for systems biology approaches to studying mammalian innate immunity. David J. Lynn, Fiona M. Roche, Timothy H.W. Chan, Jennifer L. Gardy, Geoff Winsor, Matthew R. Laird, Michael Acab, Calvin Chan, Naisha Shah, John Ling, Raymond Lo, Aaron Barsky, Tamara M. Munzner, Dan Tulpan, Matthew Whiteside, Lorne A. Babiuk, Karsten Hokamp, Robert E.W. Hancock, Fiona S.L. Brinkman. 2nd American Society for Microbiology Pathogenomics Conference. June 24-27, 2007. Halifax, Nova Scotia, Canada. <!-O7-> Abstract. The Invariance of Visual Long-term Long-term Memory to Geometric Transformation. Heidi Lam, Tamara Munzner, and Ronald A. Rensink. Journal of Vision, 6(6):983, 983a. Vision Sciences Society, Sarasota, FL, USA. May 2006. Final version: APGV 2006 conference paper. <!-O6-> Poster. A bioinformatics platform facilitating robust cross-species comparisons of innate immunity microarray data. Roche FM, Acab M, Barsky A, Chan T, Fulton DL, Gardy JL, Laird MR, Li YL, Lo R, Munzner T, Winsor GL, Wei R, Whiteside M, Babiuk L, Hancock REW, Hokamp K, Brinkman FSL. 2006 International Workshop on Systems Biology, July 17-19, National University of Ireland, Maynooth, Kildare, Ireland. <!-N5-> Technical Report. TopoLayout: Graph Layout by Topological Features. Daniel Archambault, Tamara Munzner and David Auber. Final version: TopoLayout TVCG journal paper. <!-N4-> Technical Report. Visual Mining of Power Sets with Large Alphabets. Tamara Munzner, Qiang Kong, Raymond T. Ng, Jordan Lee, Janek Klawe, Dragana Radulovic and Carson K. Leung. <!-O5-> Poster. TopoLayout: Graph Layout by Topological Features. <!-O4-> Poster. MusicLand: Exploratory Browsing in Music Space. <!-O3-> Contest. Exploring InfoVis Publication History with Tulip. Maylis Delest, Tamara Munzner, David Auber, and Jean-Philippe Domenger. InfoVis 2004 Contest Entry, one of eight second place winners. <!-O2-> Poster. BinX: Dynamic Exploration of Time Series Datasets Across Aggregation Levels. Lior Berry and Tamara Munzner. <!-N3-> Poster. Accordion Comparison of Evolutionary Trees and Genomic Sequences. James Slack, Kristian Hildebrand, and Tamara Munzner. <!-O1-> Contest. TreeJuxtaposer: InfoVis03 Contest Entry. James Slack, Tamara Munzner, and François Guimbretière. Overall winner in the inaugural InfoVis Contest. <!-N2-> Note. Geomview: a system for geometric visualization. Nina Amenta, Stuart Levy, Tamara Munzner and Mark Phillips. communication to the Proceedings of the 11th Annual ACM Symposium on Computational Geometry (1995), pp C12-13. A short note announcing the release of Geomview, a public domain 3D visualization system, aimed at the computational geometry community. <!-N1-> Note. Geomview: An Interactive Geometry Viewer. Mark Phillips and Silvio Levy and Tamara Munzner. Notices of the American Mathematical Society (Computers and Mathematics Column), Vol. 40, No.8, pp 985-988, October 1993. A short note announcing the release of Geomview, a public domain 3D visualization system, aimed at the math community. <!-N0-> Position Paper. Visualization in Geometry Research and Education. Tamara M. Munzner and Mark B. Phillips. Scientific Visualization Environments Workshop IEEE Visualization 1991. A position paper on the MinneView/OOGL project, the prececessor of Geomview.